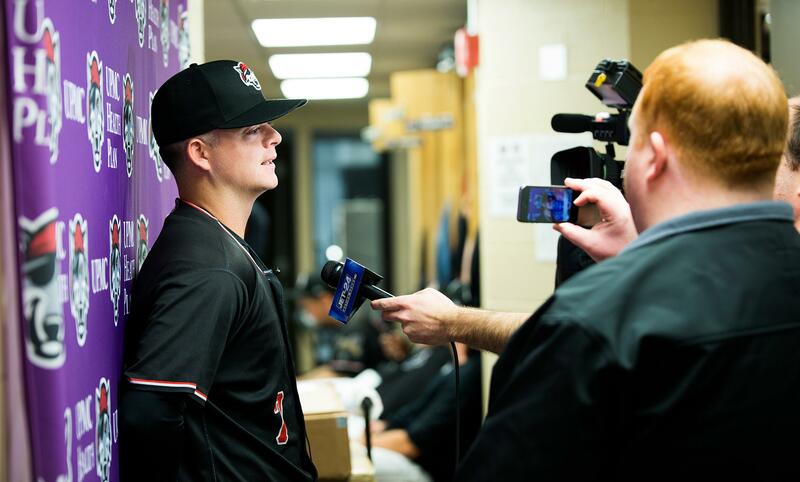 Reporters interview catcher Jake Rogers on Erie SeaWolves Media Day, which was held Tuesday, April 3. Rogers, the No. 5 prospect in the Detroit Tigersu2019 organization, split time between three single-A squads last year and is expected to be a major contributor for Erie this season. Ready or not, the home opener is coming. Nine days before the Erie SeaWolves take the field at UPMC Park for the first time in 2018, gale force winds howl across the concourse, carrying wisps of snow with them. Take me out to the ballgame. Erie SeaWolves Team President Greg Coleman has witnessed this phenomenon a time or two during his eight years with the club. He is utterly unfazed. "We are lucky to get 10 days with running water before the opener." Pumping water into the park's plumbing system too early is a risky venture; if a pipe bursts (due to water expanding as it freezes) "you literally need to take a side of the building off" to address the problem. This is the kind of mess you can't clean up by making a quick call to the bullpen. The grounds themselves are maintained by Erie Events, who work closely with the SeaWolves throughout the year. When preparing for the home opener, the greatest obstacle the grounds crew will have to deal with is frost. Snow can be cleared away, but a deep freeze locks moisture into the soil that will begin to rise to the surface as temperatures warm, rendering the field a squishy, sodden occupational hazard. Despite record-breaking snowfalls this year, Coleman is not too worried about field conditions to start the year. "We've not had a lot of good clear, temperate days, but we've had no extremes. A couple of clear days in the 50s and it would green up a bit." To be fair, UPMC Park, which opened as Jerry Uht Park in June of 1995, was never intended to function in an Erie April. Back then, the SeaWolves were the short season single-A affiliate of the Pittsburgh Pirates, competing in the New York-Penn League. They played from mid-June through early September, a time when it's easy to love baseball. Since 1999, however, the SeaWolves have been proud members of the double-A Eastern League, which begins its seasons in the depths of "spring." These are the times that try fans' souls, but Coleman believes they're better for it. "Our fans are not fair-weather; they're all-weather." For better or worse, 'til delays do us part — that is the charge of Coleman and his operations crew. "It's a lot like planning a wedding. It's a great time, but it's also gigantic undertaking. We invite guests, pursue sponsors, book entertainment, shape the ball park experience, plan the menu with our caterer." "We put on about 100 weddings a year — about 70 for our games, and 30 for other events" he says. In June, they will draft a preliminary outline for the following season; when the offseason process begins in September, they will flesh out and immediately set about executing those plans. A master document is shared between the operations team and is updated continuously throughout the offseason. In this spreadsheet, everything from national anthem singers to who throws out the first pitch to postgame entertainment (fireworks, etc.) is slotted out. A week before each home stand, the document will be reviewed to see if everything is still valid. The unexpected can and does happen — a storm system can wipe out an entire series; an unexpected guest or Major Leaguer on rehab assignment may be in town. Like the pitchers and hitters inside the lines, those who conduct the experience outside the lines are constantly reading the situation and making adjustments in real-time. It regularly demands logging in extra innings at the office. "Folks are fans sometimes of a specific team or a specific player, but people do not know how hard this team of people works," says Coleman, who has adapted himself for levels of fuel efficiency on par with a Tesla. "I slept maybe four hours last night." That's important, because rarely do the players on the field boast the sort of "name brand" recognition to generate attendance, despite their undeniable talent (there are very few players that make it to the double-A, the last true development phase before the majors — triple-A rosters often serve as a sort of "extended dugout" for Major League clubs). At points throughout this year, fans can expect to watch the Detroit Tigers' No. 1 (pitcher Franklin Perez), No. 4 (pitcher Beau Burrows), and No. 5 (catcher Jake Rogers) prospects, players that stand a good chance of making it to the big leagues, but the casual consumer won't necessarily know that (or even care). "So there needs to be other motivation— relaxation, community involvement, pleasant memories. Our focus is on finding the passion points and making our product relevant through those passion points," explains Coleman. Veteran pitcher Josh Turley, 27, was a 16th round draft pick of the Tigers out of Baylor in 2012. He posted a 3.69 ERA last season in bouncing between three levels of Detroit's farm system, ending the year with the triple-A Toledo Mud Hens. The Business Office, in tandem with its sponsors and partners, design an experience that they feel fans will want to take for a spin. The Game Day staff — those on the frontlines (concession workers, ushers, announcers, sound technicians, mascot C. Wolf and the Wolf Pack entertainment team, etc.) — assemble that experience on the field and try to ignite those passions. One of the most surefire ways to do that, especially at the Minor League level, is through a fun, quirky, or provocative (but not so provocative as to alienate) promotion. As a longtime executive in the Minors, Coleman has either conceived or encountered a number of incredibly creative (and sometimes bizarre) promotions. "There's no such thing as a bad idea; at worst, it's comic relief." One he chuckles at today is the "Vices Night" someone proposed during his time in the independent Golden Baseball League in California — people smoking "whatever they want," boozing out of flasks, and gambling in the stands — essentially the antithesis of the "family-friendly" blueprint. The best promotions are those that are inventive, reflect well on the community and organization, and have reach and mass appeal (it's a copycat league, no matter what league you're in, and the ultimate flattery is to have other teams borrow and adapt your wildly original idea). One of the more unique concepts Coleman's had a hand in is "What Could've Been Night," which won Minor League Baseball's Promotion of the Year in 2009. The single-A Bowling Green Hot Rods competed as the Bowling Green Cave Shrimp (the runner-up in the fan's naming contest) for one night, complete with new uniforms, logos, and signage. Many teams have since tinkered with this idea, even in other sports — the NBA G League's Erie BayHawks recently took the court as the "Erie Pepperoni Balls." This season, the SeaWolves will play a game as the SnowWolves for the team's "Christmas in July" promotion (Friday, July 27). Another award-winning — and briefly controversial — promotion was last season's "Alternative Facts" night, which Coleman uses to illustrate how ideas evolve organically. The seed was planted with the term "fake news" being bandied about during the 2016 election cycle. When Kellyanne Conway coined the term "alternative facts," Coleman inked it into the promotional schedule. He received a number of angry calls. "People were upset about a promotion we hadn't finished making up yet." The uproar, of course, was unwarranted. Yes, the team used a hot-button term to pique interest, but the promotion was nothing but tongue-in-cheek fun in execution, poking fun at the franchise's lack of on-field success with fake championship banners, memorabilia, and a Game Day staff totally complicit in the ruse (and against the previous year's actual Eastern League champion Akron RubberDucks, no less). Again, success as a Minor League club goes beyond on-field performance and wins and losses — those things help, but Minor League rosters are often very fluid and furthermore at the mercy of the parent clubs, whose priority is developing prospects to make their teams better. At the end of the day, what matters is that fans take home a memory or impression strong enough to return. For instance, they might launch a stuntman from a cannonball in center field into a net in front of home plate (Tuesday, Aug. 14). They might spike your insulin, if not your adrenaline (Sugar Rush Night on Saturday, June 23). And if those things fail, who could forget a night at the Cowboy Monkey Rodeo (Tuesday, June 19)? It may have been a chilly April so far, but things are indeed warming up at UPMC Park. 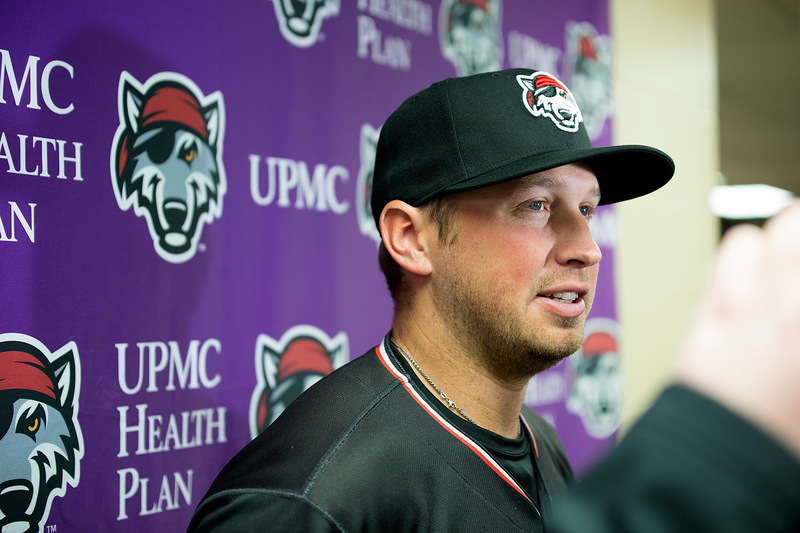 Opening weekend pits the SeaWolves against the Altoona Curve and kicks off with the Opening Day Bash on Friday, April 13 in the UPMC Park Plaza. Food, entertainment, games, and happy hour drink specials ($3 select domestic drafts) will precede the first pitch, slated for 6:05 p.m. On Saturday, the SeaWolves will celebrate Erie Day, paying homage to the City of Erie's birthday (it was incorporated April 14, 1851) with local students and organizations. The team will also recognize a local resident for his or her contributions to the community. Whether or not the weather cooperates, here's hoping this SeaWolves City celebrates many more birthdays to come.